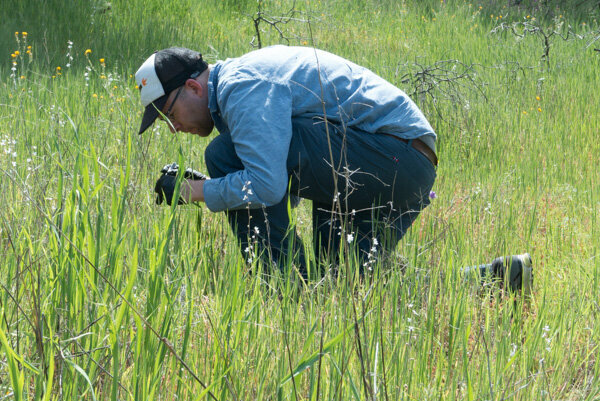 A study of woodland star wildflowers in the western United States has found remarkable diversity in the scent compounds produced by their flowers. Every species of woodland star, and even different populations within a species, may produce a unique floral bouquet, sometimes composed of dozens of scent compounds, to attract specialized insect pollinators. Twelve species and subspecies of woodland star (Lithophragma) occur in a wide range of habitats throughout western North America. They have coevolved with a group of specialized moths, called Greya moths, that pollinate and lay eggs only in woodland star flowers. Although the plants lose some of their developing seeds to the moth larvae, the benefits the plants receive from pollination usually outweigh the costs. The floral scent study, published February 11 in Proceedings of the National Academy of Sciences (PNAS), adds a surprising new layer to the complex relationship between woodland stars and their pollinators. Senior author John Thompson, professor of ecology and evolutionary biology at UC Santa Cruz, has been studying the coevolution of these species for several decades. The new study builds on previous work showing that the interactions of woodland star with Greya moths have widely varying outcomes in different ecosystems depending on which pollinators are present. "We had already shown in previous studies that the moths can find their local host plants using only the floral bouquets produced by the local Lithophragma plants. So we knew that floral scent was important to the plants and the moths," Thompson said. He and his collaborators set out to characterize the floral scents produced by each Lithophragma species in a wide range of ecosystems and see just how different they are. The researchers sampled almost a hundred populations of woodland stars in ecosystems from southern California to Washington. Although they expected to find at least some differences in the floral bouquets, the results were surprising. The first surprise was that the floral bouquets include an unexpectedly large number compounds. 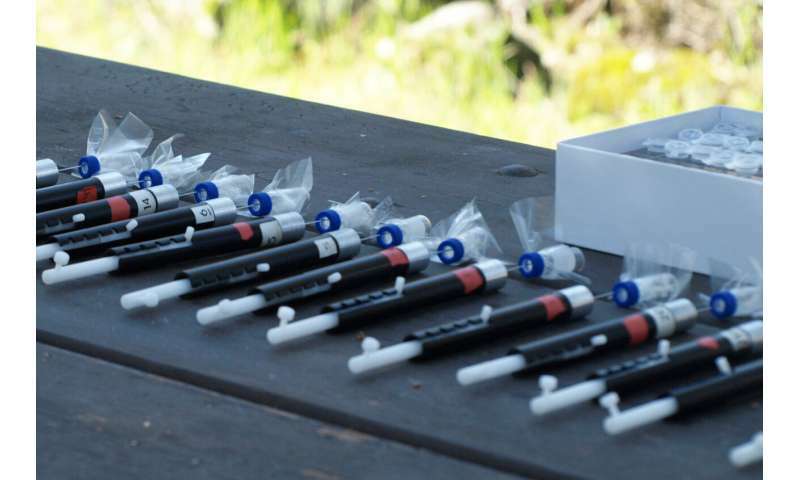 Many populations the researchers sampled had scents composed of more than 20 compounds, and some populations emitted almost 50 different kinds of scent molecules. A second surprise was that the compounds in these bouquets arise from a wide range of biosynthetic pathways, rather than one or a few pathways. "These flowers are making a lot of scent compounds, both in number and in the diversity of biochemical pathways, and natural selection has mixed and matched the biochemistry of floral bouquets in very different ways among different populations," Thompson said. 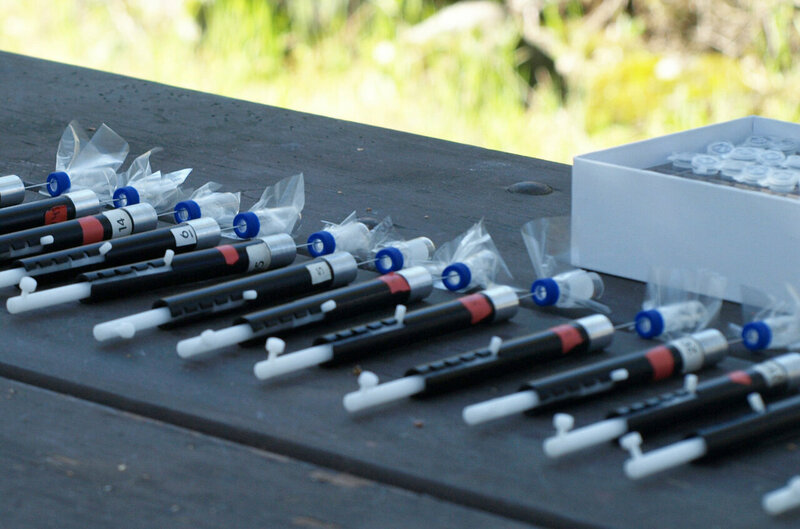 One local population may have a bouquet dominated by a variety of terpenes supplemented with a few other kinds of compounds. A population in another ecosystem may have a bouquet dominated by nitrogenous compounds, and yet others by aromatic esters or ethers. 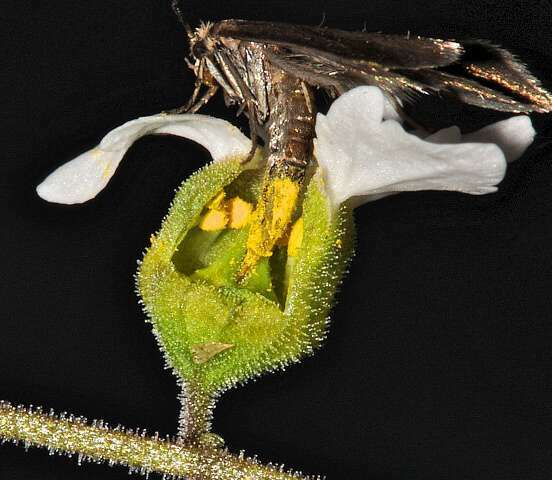 Why populations should differ so greatly in the biochemistry of their bouquets is not yet clear, but part of the answer may be in the ways that plant chemistry evolves with other traits as natural selection molds local adaptation of these plants to their pollinating moths. 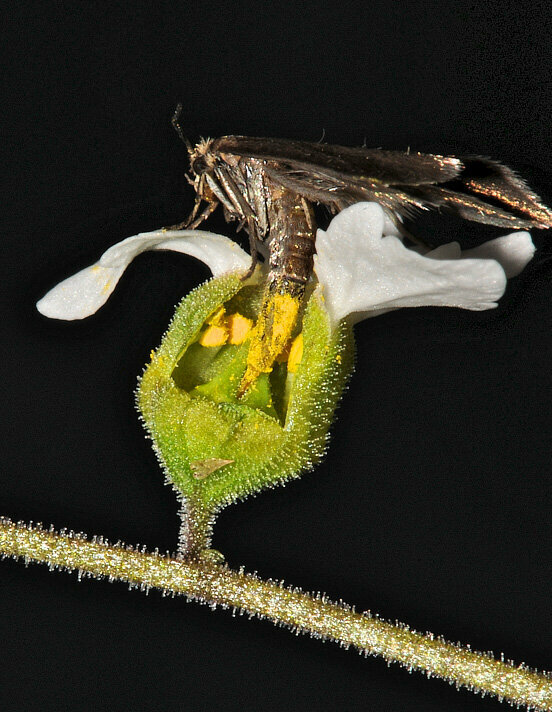 There are two different Greya moth species, and they select for different floral morphologies because of differences in how they pollinate the flowers. So a population's flower shape often depends on which moth species is present. Furthermore, the researchers have found that different scent compounds are produced by different parts of the flower, so changes in floral morphology may affect scent production. In addition to the Greya moths, other insects that are less specialized may also pollinate woodland star flowers in some ecosystems. In those sites, the presence of other pollinators disrupts the tight coevolution between flowers and moths, and Lithophragma may even evolve to exclude Greya moths (by aborting flowers in which the moths have laid eggs) to avoid paying the cost of losing seeds to moth larvae. "There are several components to this interaction," Thompson explained. "What creates a geographic mosaic of populations with different traits is the tight coevolution between flowers and moths in some environments, which gets swamped in other environments by the presence of different pollinators." The background of competing scents in different ecosystems may also influence floral scents. "The plants need to attract their pollinators in the presence of a huge array of other chemicals in that environment, so they come up with a unique signal," Thompson said. "Also, we don't have the insect side of this yet. These plants make a lot of scent compounds, but which ones can the moths detect?" These studies are part of a long-term effort to understand how the process of coevolution works in nature and how it shapes and reshapes the adaptation of species over broad geographic scales. "As we've learned more about coevolution, one of the things we've come to realize is just how complex the traits are that coevolve among species," Thompson said. "These are the kinds of studies we need if we are to make scientifically informed plans for conserving the Earth's many highly coevolved interactions at a time when environments are changing quickly. These results tell us that species coevolve as a geographic mosaic in which each local interaction between species may include unique evolutionary solutions. If we are to conserve species in a world in which environments are changing rapidly, we need to conserve as many of these links as possible."